Governor Andrew M. Cuomo today announced the completion of new track laying between Central Islip and Ronkonkoma for the LIRR Double Track project, and work on the final phase between Farmingdale and Central Islip is already underway and on schedule to be completed in 2018. The Double Track, extending from Farmingdale to Ronkonkoma, will dramatically reduce delays on the LIRR and enable more off peak service in both directions by adding 13 miles of parallel track. Together with the full MTA eTix rollout, the LIRR Third Track proposal on the Main Line, East Side Access, and four new Metro-North Stations in the Bronx, the milestone reached today moves the MTA's commuter rail priorities forward in the Governor's $100 billion Infrastructure and Development Plan for New York. "New York State is moving aggressively to bring our mass transit systems into the 21st century -- not just to meet the needs of our current population, but to foster smart, sensible and sustainable growth," Governor Cuomo said. "Adding a second track to the Ronkonkoma Branch is a project has been talked about for decades, but was never set into motion. By pairing innovative equipment with our strategy of design-build construction, we are accelerating the pace of these types of critical infrastructure projects to improve Long Island commutes and strengthen the region's economy. Put simply, we are building today for a better tomorrow." 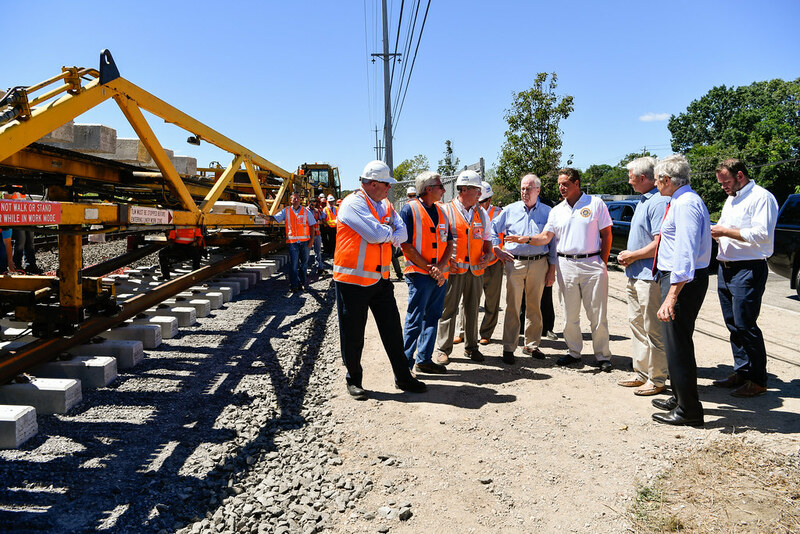 Governor Cuomo today toured the Double Track site in Central Islip with MTA Chairman and CEO Thomas Prendergast, where the New Track Construction machine was laying the final stretch of Phase I track. The New Track Construction machine lays track more than ten times faster than the MTA has ever done before, saving $2.4 million in construction costs. Photos of the Governor at the construction site will be available on the Governor's Flikr page. Video of the tour and the machine, as well as this afternoon's Double Track press conference, will follow. MTA Chairman and CEO Thomas F. Prendergast said: "The Governor has challenged us to move more quickly and efficiently in all we do and to use new, innovative ideas to advance projects. With the use of this new track-laying technology, MTA will save $2.4 million in the first phase of Double Track alone and bring us a big step forward in reducing delays and providing better service on the Ronkonkoma Branch in both directions." Ridership on the LIRR's Ronkonkoma Branch is more than 48,000 each weekday. With just one track along most of the 18-mile route between Farmingdale and Ronkonkoma, the LIRR can operate only a limited number of trains and lacks operational flexibility in the event of a disruption. If one train becomes disabled, all other trains – coming from both east and west – have no way around the problem. The Double Track project will enable the LIRR to provide more frequent off-peak service to the Ronkonkoma Branch in both directions, with off-peak service going from one train every hour, to one train every 30 minutes in both directions. The project will reduce delays associated with service disruptions by giving the railroad flexibility to go around obstacles that it cannot currently in single track territory. Work for the Double Track project is being done in two phases using design-build contracting; funding for the project of $387.2 million has been secured in its entirety by Governor Cuomo and the State Legislature. Phase I adds 3.5 miles of track between Central Islip and Ronkonkoma, and new track construction of this segment will be complete as early as today. Phase II work is already underway, which primarily focuses on building the remaining track between Farmingdale and Central Islip, as well as signal installation the entire Farmingdale to Ronkonkema distance. The MTA awarded design-build contracts for these components in June. In large part because design-build contracting holds private construction management firms accountable for achieving deadlines set by the MTA, the Double Track is on schedule to open as initially announced in 2018. By pairing innovative equipment with our strategy of design-build construction, we are accelerating the pace of these types of critical infrastructure projects to improve Long Island commutes and strengthen the region's economy. The Double Track project marks the MTA's first-ever use of the New Track Construction machine, which is capable of laying one mile of track per day – more than ten times faster than the 500 feet of track per day that the MTA manually laid previously. By speeding up this process, the MTA is significantly improving productivity, increasing safety and reducing the potential of construction disruption to local communities. Use of the machine reduces the cost of laying Phase I's 3.5 miles of track from more than $3.6 million to $1.2 million, saving approximately $2.4 million. In concert with the proposed Main Line Expansion Project, which would add a third track to the heavily utilized segment between Floral Park and Hicksville, the construction of the Double Track between Farmingdale and Ronkonkoma will support Long Island-wide resiliency by enabling the LIRR to provide better Main Line Service options in conditions where either the Montauk Branch or Port Jefferson Branch is compromised because of severe weather. In addition to the Double Track and the proposed LIRR Expansion Project, the railroad is also moving forward with other projects that will help improve railroad operations, including the Jamaica Capacity Improvement Project which streamlines the Jamaica track layout and modernizes the switch and signal system; the expansion of the train storage yard in Ronkonkoma and the addition of pocket tracks along the Port Washington and Babylon Branches. Governor Cuomo also announced today's full, system-wide implementation of MTA eTix, the new mobile ticketing app that allows Metro-North Railroad and Long Island Rail Road customers to use their smartphone as a boarding ticket. MTA eTix empowers LIRR and Metro-North customers to board using their smartphone instead of a paper ticket, as well as check schedules and see train service status, which interconnects with the popular Train Time apps for Metro-North and the LIRR. The app also offers account management tools, giving railroad customers the ability to secure refunds for unused mobile tickets, request duplicate receipts, and manage profile info such as password and linked credit card numbers. And for customers who use pre-tax commuter benefit programs, the app allows users to split their purchases between a pre-tax benefit card and another card. More information about the app is available here. Download links for smartphones are below. Today's addition of the New Haven Line's three branches and the rest of the LIRR marks the third and final phase of the rollout. MTA eTix first became available on Metro-North’s Hudson Line and the LIRR’s Port Washington Branch on June 30, and on July 25 the app debuted on Metro-North’s Harlem Line. MTA eTix is a central component of the MTA improving the customer experience, complementing a deep integration of technology across the board. The MTA's record $27 billion Capital Program secured under the leadership of Governor Cuomo supports the addition of 2,340 buses and 1,025 redesigned subway cars with USB charging ports plus Wi-Fi; full cell phone connectivity, Wi-Fi and countdown clocks in every subway station; 31 reimagined subway stations that also include USB charging ports and enhanced digital information hubs inside and outside of the station; and an accelerated plan to create a new fare payment system to replace the MetroCard.